The males in my house eat more cereal than I would think humanly possible. While I make most things from scratch cereal is one of the few exceptions. There is only so much granola one household can eat before they go a little crazy and want a box of Lucky Charms. My husband has always been a huge cereal eater. What I wasn't prepared for was that my two sons would follow suit. They can eat an entire dinner and still have room for a bowl of cereal for dessert. Now both of my boys are rail thin. The youngest was under weight until he hit 3 years old. Apparently large amounts of cereal does not correlate into gaining weight because if it did my two boys would be the size of a house. The other food that they are obsessed with is steak. When my youngest was two he started stealing food of my plate, mostly steak and seafood. He refuses to touch the kids menu so when we go out to eat we normally split a steak. That's right my 4 year old eats steak for dinner. I figure it has to be healthier than the fried chicken and macaroni on most restaurant kid's menu (they seem to always be loaded with fat and cheese!). I make a lot of flat iron and skirt steak at home since the cuts are inexpensive and they are so delicious grilled. This week I tried a new recipe for Coffee Marinated Skirt Steak from the August 2013 issue of Bon Appetit magazine. This recipe has 9 ingredients. It takes 1 1/2 hours of total time, 30 minutes of which is active and makes 4 servings. For the Dijon mustard I used country Dijon. I love the texture and taste, it's great with steak. I honestly I forgot to cut the skirt steak into 4 pieces. The steak still fit at an angle onto my grill so it was fine. If you have never cooked skirt steak before there is a major step the magazine left out. You must take off the silver skin on the steak. I would love to say that it is always gone when you buy from the grocery store, but every time I have bought skirt steak from either the grocery store or big box stores it has to have the silver skin removed. Just make sure to check before you place the steak in the marinade. If you never let your meat sit before serving stop! Pork and beef really need to sit for at least 10 minutes of rest before being sliced. This allows the delicious juices to soak into the meat. If you miss this step all the great flavor will spill out the moment you cut into the meat. Resting after cooking makes all the difference I promise. Also as a side note, while this steak will look raw or underdone to many reading this post, skirt and flat iron steak stay red in the center. This steak is medium, medium rare for my husband and I and straight medium for my kids. Don't freak out if your skirt steak appears red, it will temp spot on. That's another reason why I love having a great thermometer. The thermometer I use is recommended by America's Test Kitchen (it's a little pricey at $100) and a great investment, no more overdone meat! This photo also is a little redder than in person due to lighting etc. This steak turned out very tender and had great flavor. Even my two picky boys loved the recipe and asked for seconds. This recipe would be great with mashed, roasted or baked potatoes on the side. Asparagus would be a great vegetable side, steak and roasted asparagus are great together. 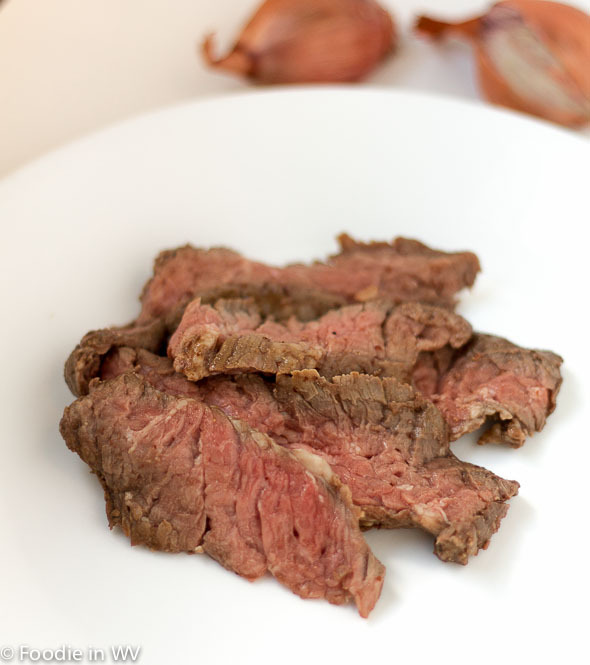 For the recipe go to Coffee Marinated Skirt Steak. With a sweet and savory flavor this recipe for Coffee Marinated Skirt Steak is easy to prep and very tender. Would be great for summer entertaining. Se ve muy rico el churrasco cocinado a punto es una delicia,hugs,hugs. Glad to know that my boys aren't the only ones :) The coffee really is delicious as a marinade! I eat my steak well done because the texture of the pink makes me gag LOL. Skirt steak stays pink even when it's well done :) It would pretty much have to be burnt to not be pink on the inside. I know what you mean though since my mom was the same way! I like skirt steak as it has so much flavor. I have one in the freezer and I'll have to give this recipe a try. It really does have great flavor, I love it! This makes m want to go get the steak out of the freezer, but it won't thaw in time for supper. Maybe a trip to the market is in order. Lovely recipe! I hate waiting for meat to defrost :) Thanks for the sweet comment! Never thought to marinate steak with coffee, and I love both! Wow. The coffee does a great job as a marinade! I have two rail thin boys too that are absolute carnivores and cereal lovers too. Coffee adds a really nice subtle flavor to meat. I have been adding it to my pot roast. Glad to know my boys aren't the only ones :) I love the idea of adding coffee to pot roast! I rely on my food thermometer because I am terrified of giving someone (or myself) food poisoning. Marinating in coffee sounds like a great idea, something to try out before grilling season is over! I do too, I temp all meat so that my two boys don't get sick :) If it's under I put it back in. So many recipes have the time wrong so I rely on my thermometer to make sure everything is perfectly cooked!